Pre-P.S. : I have a guest post up at Bloom today with two vegetarian meals that are sure to knock your veggie-loving socks off. Kind of timely in light of the decadent treats of today’s post. Balance, that’s what I’m all about! Oh boy. Seriously. Wow. Oooh doggity. These babies are good. So good that I’ve made them three times in the last week. So good that I had to make a midnight trip to the store to get peanut butter because I realized I was all out. So good that it is literally impossible to eat just one. Or three. Or five. So good that I had a million other things to post and these bonbons trumped them all. A sweet, creamy, peanut buttery center loaded with toffee bits and pretzel pieces is smothered in chocolate and topped with additional crunchy delights. A worthy snack for a group of starving kids or elegant enough to serve at the end of a gourmet dinner party (I may or may not have used them for both occasions already), these bonbons have taken up permanent residence in my treat portfolio (and my hips…but that’s a problem for another time). In a large bowl with an electric mixer, cream the butter and sugar together until evenly combined. Add the peanut butter and mix well, scraping down the sides of the bowl as needed. Stir in the toffee bits and pretzel pieces by hand with a wooden spoon or rubber spatula. Line a large rimmed baking sheet (12X18-inches or several smaller baking sheets) with parchment or waxed paper. Roll the peanut butter mixture into 1-inch or so (it doesn’t have to be exact) balls and place them on the lined baking sheets. Cover loosely with plastic wrap and freeze for 15-20 minutes until firm. At this point, the balls can be transferred to a sealed container or freezer ziploc bag and frozen for up to 2 months. Meanwhile, melt the chocolate and shortening/butter together in a microwave-safe bowl or in a double boiler until completely melted and smooth (taking care not to overheat the chocolate as that can cause white streaks, bloom, to appear in the hardened chocolate). 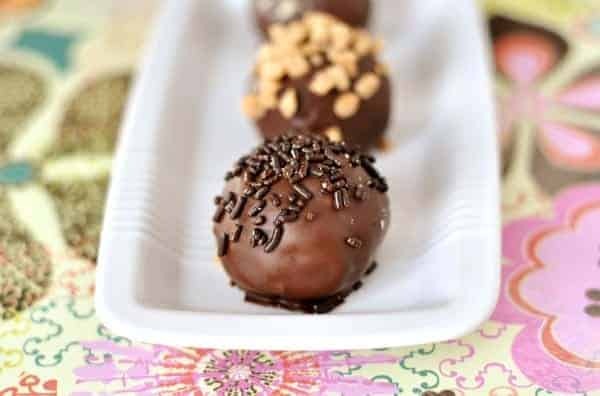 One by one, toss a formed peanut butter/pretzel ball into the melted chocolate and using a fork, cover the ball with chocolate. Lift the covered bonbon out of the chocolate with the fork and tap the lower stem of the fork (right above where the rectangular tined fork part ends) on the edge of the bowl to let excess chocolate fall through the tines of the fork. Scrape the bottom of the fork along the edge of the bowl and transfer the covered bonbon to a parchment lined baking sheet (you can use the same baking sheet(s) used for freezing the balls if you have room). Set the bonbon very close to the parchment paper and using a second fork or butter knife, gently scoot the bonbon off the fork onto the baking sheet. Immediately sprinkle your garnish of choice on the top of the wet chocolate before it sets. Refrigerate the bonbons until ready to serve. To chop the pretzel sticks, I place several large handfuls of pretzel sticks in a ziploc bag, seal, and roll over the top with a rolling pin until the pretzels are crunched up well. I measure out of the bag and continue the process until I have 2 cups. 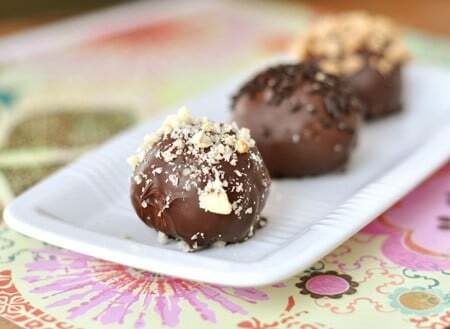 These bonbons can be made up to three days in advance. 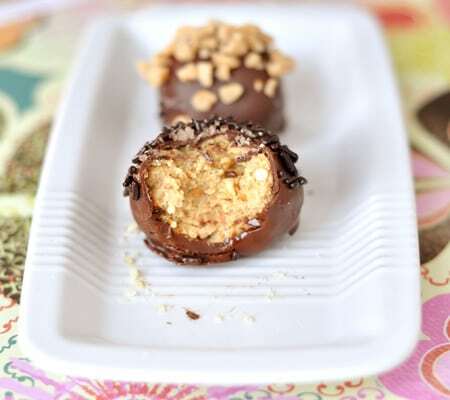 The peanut butter pretzel filling can be made and formed into balls and frozen for up to 2 months before dipping. Here's a quick video tip on tempering/melting chocolate and another on dipping things in chocolate like a pro. FYI: My preferred brand of chocolate is Ghirardelli. I made these pretty treats last night, & I must say they came out gorgeous! I didn’t have any toffee bits on hand, but there is so much flavor & texture going on in these that I didn’t seem to miss it. The chocolate didn’t seem to melt up as well as other times I’ve melted it, so I just added some milk until I got the desired consistency. The fork/knife trick was totally key!! Thank you, Mel, for another winner. These are as good as they look! My girls and I made them for my hubby and son for Valentine’s Day but I’m not sure how many they’ll get as we keep sneaking one or three all day! I used Ghiradelli chips for some and found they were a bit trickier to work with than the Ghiradelli Melting wafers. The wafers were a better consistency to roll the balls in. We did balls a little smaller than one inch and got a little over 100 out of our batch. They were not as pretty as yours, Mel, but they are beyond delicious!! We will be making these again! Thank you for sharing your fun, easy, tasty recipes! 10-12 dozen? I got 3.5 dozen! Mel, what did I do wrong besides make the balls too big and eat half the batter while rolling the balls ;). These are my favorite! It’s been a couple years since I’ve made these but I remember making them pretty small. Hi Mel, just wandering can you freeze these after they are covered in chocolate too? I haven’t tried it, Candace, so I’m not sure but I’ve frozen other truffle type treats before and they freeze pretty well with the chocolate coating. Has anyone tried these with soy nut butter or sun butter? As a previous commenter stated, we too have peanut allergies in our house. I’d love to make these but am not interested in putting time into something if they won’t turn out. Marci, I haven’t noticed the pretzels getting mushy. They hold up pretty well. Do the pretzels get mushy if you don’t eat them right away or when you freeze them? Amazing!! My husband helped me dip the pb balls in the chocolate-he used skewers we had to swirl them in the chocolate and then used the rounded or handle side to scoop them up and sit them on the wax paper…can’t wait to share them with our family!!! First of all, thanks for all the great recipes! This afternoon I made the peanut butter mixture for the bon bons and chilled it before rolling into balls. Even after chilling for several hours it was still so soft and sticky that it was difficult to roll. I was just wondering how this mixture is for you-soft or firm? Also, how fine do you crush your pretzels? Thanks for your help! Hi Juli – this mixture when I make it and after chilling is the same consistency as a chocolate chip cookie dough or something similar. I don’t finely crush the pretzels – as in, I don’t crush them to smithereens into a fine powder – I keep them on the smaller side of chopped with still a little substance and crunch to them. This recipe is pretty flexible – if you are having stickiness issues, add more powdered sugar gradually until it is firm enough to roll into balls. Good luck! Mel, curious, I know you have that you could use bittersweet, or milk, or semi-sweet chocolate, but what do you think is the best to use. To me the semi-sweet or the bittersweet would be the best contrast with the yummy sweet filling, but I wanted to get your opinion. Thanks! Hi Roni – I prefer a mixture of semi-sweet and bittersweet because you are right, both of those types of chocolate balance the sweet filling really well! I made these just this past week and they are divine, simple and you absolutely cannot eat just one – just the right balance of flavors! Thanks Mel! I laughed at your response. Too funny and all too true. Thanks for putting things in perspective. I’m totally going to go with the Jiff:-). What kind of PB do you use? We normally use the Organic Costco PB. It is just peanuts and nothing else. Would that be too bland? Excited to try these. Hi Bri – I use Jif. It’s probably not the healthiest peanut butter but these bonbons aren’t that healthy, if you know what I mean. I think you could use the peanut butter you buy but might consider adding salt or a little more sugar. Mel-I found your blog through a friend of mine and I’ve been addicted. We work with college students and I make something sweet at least once a week for them,. So I’ve been making things from this blog and everyone just LOVES everything I’ve made. Thanks 🙂 I’ve made the bon-bons this week, and they were a hit. There were left overs (almost never happens) so in the last two days I ate them all, and I don’t even like peanut butter that much. S0… Sooooo good! Love it, Thanks!!!! first of all, i love the term ‘bonbons’–it sounds so hoity-toity! secondly, yum–you’ve combined some pretty powerful flavors here and i like it. i like it a lot. This looks so yummy! I can’t wait to try it. I shared this recipe on my Must Try Tuesday blog post. Oh dear, Mel. These look fantastic! I’ll be dipping in milk chocolate since I’m not a chocolate fan, but I can’t pass these up. Like Reese’s on steroids! Mel – are you using chocolate chips? And milk, semi-sweet or bittersweet? The choice is ours? Hi Brenda – I usually use whatever chocolate I have on hand, sometimes chocolate chips, sometimes bar chocolate (like the large bars of baking chocolate), sometimes a combination. And yes, you can use whatever richness of chocolate you like – I prefer semisweet or bittersweet but milk or white would work great, too! Made these yesterday. They were easy to make, but I didn’t realize how much time it took to dip them in chocolate, although the fork method made them perfectly smooth! I didn’t love the crunchies inside- I think next time I’d blend the pretzels so the only crunchies were the toffy. Everyone seemed to enjoy them alot and they looked beautiful. Oh my goodness. I was printing off your Oven-Baked Chicken recipe that has been on my screen for a few days now and when I came back to your site, these mouth-watering delicacies were so nicely staring me in the face. Guess I know now what we are having for dessert! Thanks keeping me motivated to hit the gym every morning! Keep up the good work – I love your site. Oh my good heavens, this recipe looks amazing!!! Thank you! I can’t wait to try it. I just found your website from a suggestion on Facebook, and I’m loving it. You do such a great job with writing and photography. And your recipes look so delicious. Your site is my latest bookmark. Thank you!! Oh. Wow. I haven’t even made them yet & I can already feel my hips getting bigger. You are KILLING me here with these. KILLING…..ME! But more importantly, I adore your sense of humor. I literally laughed out loud, and that is saying something. Thanks for the laugh, and the drool. I shall NEVER make these, because rest assured, I’d eat them ALL! OMGoodness. I gave up chocolate for Lent. This post is delicious looking torture. Oh, these look sooooooo fabulous! I have to save this for gifting–I just love giving treats like this! Oh my – there goes my week – I had so much to do, but this will have to go to the top of the list. These look delicious! Umm… can you please send me some of these!? They look fabulous. Pretzels and toffee….I think I drooled on my keyboard. Wonderful bonbons! Mel, I just love your posts. I want to try every single recipe you do! Thanks for the inspiration and frequent updates! by the way–do you think these will ship okay or do you envision melting? Hey Natalie – hmmm, I’m not sure these would ship the best, especially in warmer weather. The chocolate could get kind of melty and with the butter in the middle, they do best refrigerated. oh my! I will be making these soon! Hubby is a big fan of peanut butter…I just read aloud to him the recipe ingredients….guess where I headed now? to the grocery store!! He has strongly suggested they be dessert tonight! Thanks for sharing this treat. Those look ridiculously good. I can see why these trumped everything else. I avoid peanut butter b/c my son is allergic – but these I may have to try with a peanut butter substitute. They look too delicious to pass up!! These look so delicious! Lately I cannot get enough of the sweet-savory combinations and I know my husband and I both would enjoy these so much. I’ll be trying them soon. Thanks for sharing, Mel! I could kiss you Mel! These look sooooo good. These are probably my most favorite things all combined in a tiny yummy little ball. The scary thing is that I probably have everything I need to make them. There goes my diet for the day 🙂 I think that I might try some dipped in white chocolate because I love that peanut butter/white chocolate combo! Thanks for another fun recipe! These look wonderful. 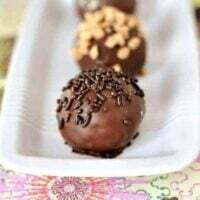 I made a bunch of bonbons a few months ago and found a fast way to roll them in the chocolate. I think it was on the Pioneer Woman blog. I put on non-latex gloves, then wash my hands (to make sure they are clean), put a bit of the warmed chocolate on your hand then roll the bonbon in you hand quickly. It puts a nice thin layer of chocolate on the bonbon and seems to go quicker than the dunk/fork method. They don’t get that smooth look, more of a rustic look…if you like that kind of thing. I can’t wait to try these out for an upcoming birthday party. Wow. I think I found the first confirmed recipe for my Easter Baking Extravaganza. As someone who loves those M&M Pretzels (an understatement) these look terrific. Just hope I can stop myself from eating them as I make them :). Oh man…I’m going to make these and then eat them all! As if pb and chocolate weren’t enough, you go on and throw in pretzels AND toffee. Yum, yum, yum! Oh, golly — I’m pretty sure I will need to make these ASAP. All my favorite things together in one ball o’ goodness! Made your wicked good toffee cake last night. Now I have to make these yummies! Good bye diet, hello larger Jean size. I’ve seen quite a few bonbon recipes around, but this one takes the cake. Toffee? Pretzels? Please, Melanie, have mercy and post a salad next. will you please let me know what type of toffee bits you used. i am not familiar with any of them and so want to make this recipe!!!! ChinaMama – I usually buy the Heath toffee bits (the ones not covered in chocolate). I just love your website. I’m sure you get told that all the time, but your website really helped me get excited about cooking. I got married 2 years ago to a widower with 3 children and now I have a fourth. One of the most difficult tasks has been cooking since my extent of cooking before was to pop a Lean Gourmet in the microwave and steam some broccoli (ok, frozen Steamers Broccoli). I found your blog a few months ago, and my life is a ton better. Thank you for your step by step instructions and for sharing your amazing recipes. My family thanks you, too :). You’re grounded! You are not allowed to make stuff so delicious looking that it causes me to ignore my to-do list and go to the grocery store to buy ingredients immediately! Oh, yum! These sound similar to buckeyes… which I love! I’m definitely adding this to my recipe book. They will be great to make at Christmas as well. I love the pictures and the recipe looks delicious. I’m a big fan of Jill O’Connor and can’t wait to try this one. The pb pretzel bites are my FAVORITE! The recipe on my site is the most viewed, and with good reason. They are easy and poppable, which is also deadly! Oh, my these look ridiculously good!! You have combined all of my favorite flavors! I could see how these could be addictive!